We’d love your help. 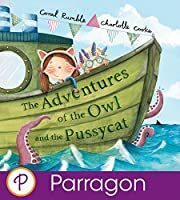 Let us know what’s wrong with this preview of The Adventures of the Owl and the Pussycat by Coral Rumble. To ask other readers questions about The Adventures of the Owl and the Pussycat, please sign up. This is a fun and inventive take on the popular nonsense poem The Owl and the Pussycat by Edward Lear. I love that it’s written and illustrated by a mother and daughter team – it’s so cool to do things like that in a family! I read this with Little Moore as soon as it came through the door, and he’s had it before bed several times too. The gentle rhyming and pastel colour scheme mean it works great as a bedtime book. In this book, the owl and pussycat are two dressed up children who are having an imaginative playtime with a cardboard box. They meet lots of colourful and quirky characters on their journey and Little Moore loved pointing at all the different creatures. It’s a fun one to read aloud and I’m sure it’ll become a favourite with Little Moore as he grows older. The illustrations are really beautiful and perfectly capture the words of the story and bring it to life. I loved the colour scheme – it’s different to a lot of the more cartoony coloured books on his shelves and that makes this one stand out. Based on Lear’s The Owl and the Pussycat, The Adventures of the Owl and the Pussycat is a delightful modern take on the poem. The Adventures of the Owl and the Pussycat takes very little time to read, but the text rhymes well and provides some lovely new vocabulary for young children with words such as ‘dangling’ and ‘jangling’. Despite the textual brevity, I can see hours of fun and educational value in this book. it’s not just the main text that has wit and rhyme, but the small touches that rew Based on Lear’s The Owl and the Pussycat, The Adventures of the Owl and the Pussycat is a delightful modern take on the poem. The Adventures of the Owl and the Pussycat takes very little time to read, but the text rhymes well and provides some lovely new vocabulary for young children with words such as ‘dangling’ and ‘jangling’. Despite the textual brevity, I can see hours of fun and educational value in this book. it’s not just the main text that has wit and rhyme, but the small touches that reward extra time spent in reading the story are lovely. The fact the boat, with a nod to Lear, is called the ‘Petit Pois’, the passport stamps (especially for Pirate Cove) and the wanted poster for the seagull all add layers of detail and language that appeals to adults and children alike. I love the focus on nature as so many children live in inner city environments and there is so much joy in the discovering new creatures like the swordfish, puffin and lobster. The way in which the little boy wears glasses is a real benefit to those with children struggling with sight early on and I liked the fact the two children are dressing up and using their imaginations as they ‘sail’ away in their cardboard box. However, it is the wonderful illustrations that give verve to the book and bring the text to glorious life. They are simply glorious. I also think they add to the numeracy too, perhaps counting the audience members at the flute concert, or the number of times the naughty seagull appears. I always love reading rhyming books to my children so the fact that this one is loosely based on a very well known poem made me even more keen to read it. This has been one of E's favourite bedtime stories in recent weeks, she loves looking at the beautiful, bright illustrations and spotting new things on each read-through. One of our favourite things about this book is that E can "read" it back to me. This is because there aren't loads of words, just enough to tell the story, so after we had rea I always love reading rhyming books to my children so the fact that this one is loosely based on a very well known poem made me even more keen to read it. One of our favourite things about this book is that E can "read" it back to me. This is because there aren't loads of words, just enough to tell the story, so after we had read it a few times she could remember the rhyme for herself (with a few cute E alterations of course). We also love how imaginative the storyline is and how perfectly the illustrations bring all the crazy scenes to life! The idea of a lobster playing catch particularly amused E 😄. The owl and the pussycat themselves were a fabulous twist on the traditional version. In my mind the two children made the adventures more relatable to little ones - playing these kind of games are something all children do, so this simply gives them another idea for an imaginary world. With their wild imaginations and sense of adventure anything is possible and this story really brings those days to life. 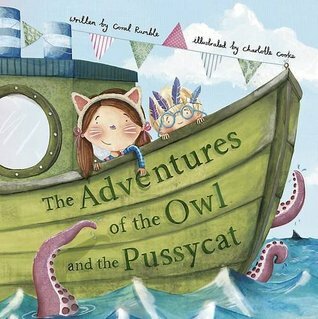 A fun read about two children and their homemade ship out on the wild seas of imagination, and what an imagination they both have!! We loved this story, anything to do with animals is a BIG hit in our house and there are tons of them in this book. Lily-May enjoyed pointing out all the different ones she spotted, some even new to her, we had to make the noise to go along with which animal we spotted. The illustrations are out of this world! No detail is left out, i especially like the Puffin page with his stamped passport…….he definitely gets around. The wanted sign for naughty seagull made me giggle. Suitable for very young children only. The pictures are delightful, but it is just a series of pretty pictures. If there was only a single word to sum up The Adventures of the Owl and the Pussycat, then it would be “adorable”. It covers the adventure, how the story of Owl and Pussycat is told and the illustrations. There might not be that many words in this book, but there is a lot of adventure. The narration is lyrical, for reading aloud it almost feels like it should be sung – but I can’t confirm that as I didn’t test this theory. Charlotte Cooke’s illustrations work amazingly with the story and each page If there was only a single word to sum up The Adventures of the Owl and the Pussycat, then it would be “adorable”. It covers the adventure, how the story of Owl and Pussycat is told and the illustrations. Charlotte Cooke’s illustrations work amazingly with the story and each page is its own treasure. There is so much to look at. Not only that but things that happen at the beginning have a continuation, such as the naughty seagull getting a ‘wanted poster’ a few pages later. 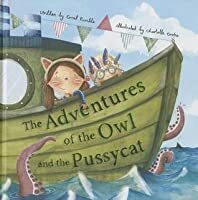 This is a great book for younger children, we go on a journey with the owl and the pussycat. This is explored through verse accompanied with beautiful illustrations. This is a story that has been adapted from the original version but should be one everyone shares with their child. This is a book I would recommend to others to share with their children as they will get a lot of enjoyment out of it. Cute book! I plan on using it for one of my Toddler Times.